Get Started on Your Heart-Healthy Shopping List! Before heading out to the grocery store take a minute and review these heart-healthy food choices. Don’t be caught by surprise with strange ingredients listed on products labels, or spend endless hours at the supermarket searching for healthy foods. 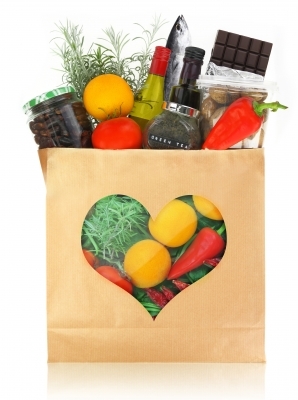 Here are some ideas when creating your shopping list with food options that fuel your heart. 1. Omega-3 Essential Fatty Acids: Much research shows the benefits of Omega-3 in cardiovascular health. Omega-3 is an essential fatty acid, meaning our body doesn't naturally produce it, and must be obtained through the diet. Certain fish are an excellent source of Omega-3, yet there are many food options available for vegans that are also high in Omega-3. If you're worried about heart disease, eating one to two servings of fish a week could reduce your risk of dying of a heart attack by a third or more….Omega-3 fatty acids may decrease triglycerides, lower blood pressure, reduce blood clotting, boost immunity and improve arthritis symptoms, and in children may improve learning ability. Shopping List Items: Salmon, sardine, tuna, eggs, nuts, flaxseeds, soybean oil, parsley, spinach, pumpkin seeds, breads, and cereals. 2. Fiber: There are two types of dietary fibers: soluble and insoluble fiber. There are foods that contain both soluble and insoluble fiber. Most Americans get only about 15 grams of fiber per day in their diet. But the 2005 Dietary Guidelines for Americans recommends about 25 grams for women under 50 and teenage girls. Teenage boys and men under 50 (who consume more calories than women) require upwards of 30-38 grams of dietary fiber daily. A. Soluble fiber: is a fiber that dissolves in water, forming a gel-like substance, which slows down the digestive process. Soluble fiber gives the feeling of “fullness”, promoting weight control, lowering LDL’s (bad fats), and stabilizing blood glucose levels. Shopping List Items: Oatmeal, oat bran cereals, oats, barley, flaxseeds, apples, beans, legumes, carrots, cucumbers, and oranges. B. Insoluble Fiber: As stated in WebMD, insoluble fiber is the gut-healthy fiber, preventing constipation by speeding up the passage of food through the G.I. (Gastrointestinal) tract. This type of fiber does not dissolve in water, but rather adds “bulk” to your diet. Shopping List Items: Whole grain cereals, wheat bran, barley, cucumbers, onions, zucchini, green-leafy vegetables (e.g. spinach and broccoli), nuts, raisins, and the skin of fruits and vegetables. Shopping List Items: blueberries, cranberries, strawberries, prunes, plums, red kidney beans, and pecans. 4. Soy: Is a plant-derivative food available as soybeans, soybean oil, and soy powder. Many foods are made from soy such as tofu and soy milk. The Circulation Journal of the American Heart Association (AHA) shares that soy products are favorable to cardiovascular health because of their high contents of polyunsaturated fats (healthy fat), and low concentration of saturated fats (unhealthy fat). Soy protein has gained considerable attention for its potential role in improving risk factors for cardiovascular disease (CVD). In October 1999, the US Food and Drug Administration (FDA) approved labeling for foods containing soy protein as protective against coronary heart disease.The FDA based this decision on clinical studies showing that at least 25 g of soy protein per day lowered total and LDL cholesterol. Shopping list Items: Soybeans, tofu, soy burgers & patties, soy milk, soy yogurt, soy cheese, and more. 5. Healthy Fats: There are different types of fats, but the healthier fats are the mono & polyunsaturated fats. These fats are liquid at room temperature. According to the Mayo Clinic, mono & polyunsaturated fats improve cholesterol levels, decreasing the risk of heart disease. Shopping List Items: Sunflower oil, olive oil, corn oil, sesame oil, avocados, and nuts. * All information shared in this article should be discussed with your healthcare provider prior to incorporating any suggestions. This article is for informational purposes only, and is not intended to provide advice or direct client decisions. very informative! will make these a staple in my grocery checklist. Hi Paloma. Glad to hear you found this article to be useful! Thanks for sharing your feedback with us!